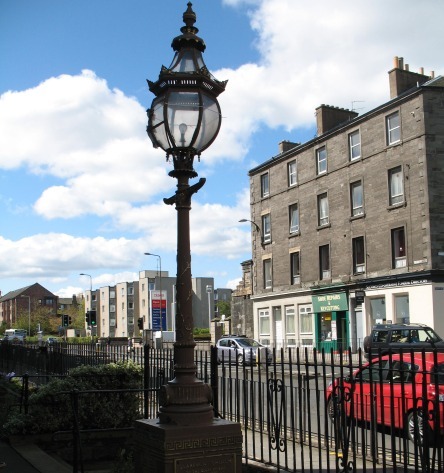 Retired Edinburgh civil servant Bob Lawson is spearheading a project to restore the Leith Boys’ Brigade Company War Memorial at the foot of Easter Road. 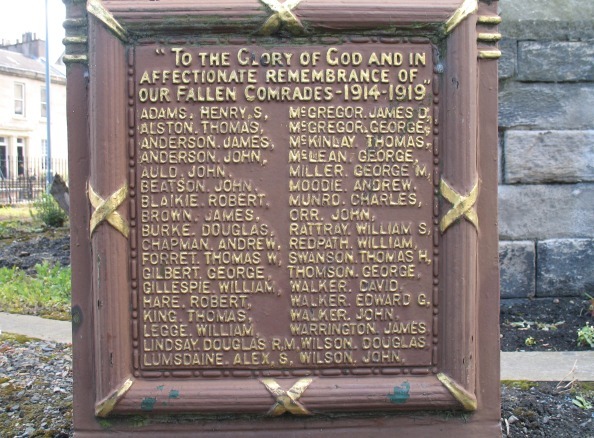 The Memorial was erected by the ex-members of the Company and unveiled in 1925. Initially it commemorated those who lost their lives during the 1914-18 War but later names were added to remember those lost in the 1939-45 War. The Memorial takes the form of an ornate cast-iron lamp stand with gilded highlights, standing on a plinth bearing the names of the fallen. Unfortunately the lamp head has deteriorated in recent years due to water ingress causing severe rusting of the metalwork at the base of the lamp which has had to be removed for safe keeping. Metalwork restoration to the head of the lamp is essential. The aim of the project was simply to refurbish the memorial; however after closer examination it became clear that patching and making good the corroded metal and paint work would be no more than a cosmetic exercise. In order to pay due respect to such a splendid and possibly unique memorial and to the names of the fallen, a complete restoration will hopefully be carried out in time for the 100th anniversary of the declaration of War on 3 August. Removal of the entire memorial for specialist cleaning, painting with modern preservative paints and renewed gilding will completely restore the lamp to its original splendour and ensure that it will stand as a supreme memorial light for many years to come. In round figures, the total cost of complete restoration is around £9,000. Of course a cheaper patch and make good for a few years job could be done. But this would not pay due respect to the names nor to the craftsmen who designed and moulded the cast iron work. 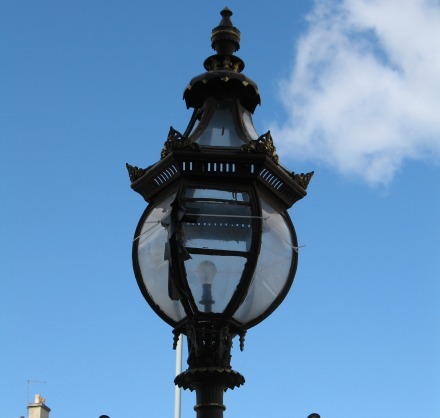 An important aspect of the job is that the City of Edinburgh Lighting Department have offered to provide a time switch and LED bulb for the lamp so that it will be lit in sequence with the street lighting throughout the year. This will make for a memorial Beacon at the junction of Easter Road and Lochend Road for time immemorial. Grants are available from various sources for the repair, maintenance and restoration of war memorials and historic monuments. An application for grants is being made but if successful these will not cover the full amount. Bon told The Edinburgh Reporter: “Quite apart from having worked with veterans of both World Wars and been associated with various events in Flanders over the years including ceremonies at the Menin Gate in Ypres, I feel very strongly that it is important to maintain our heritage in terms of social history, maintenance of buildings, monuments, culture, works of art and literature. “This particular monument fulfils many of these objectives. I don’t expect everyone will agree but I hope that next year will awaken the people of Leith and the wider international community to the supreme sacrifice made by many millions of servicemen and women over the centuries in the cause of freedom and the folly of wars. That they will think not only of the war dead but of the broken families, the refugees and the continuing atrocities being committed throughout the world today. An interview with Bob can be heard here. 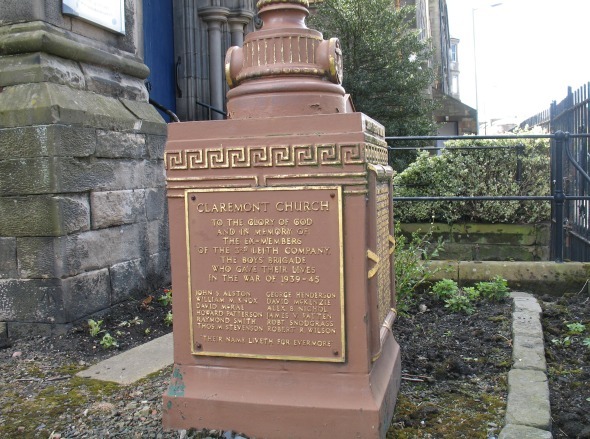 In addition, 72 year-old Bob, who was at one time a telegram boy in Stockbridge and a postman in Leith, has also been researching the names on the memorial, with the assistance of Church Elder Joanne Baird who is a budding genealogist, and Company Registers going back to 1911 and photographs from 1888 to 1920 have been recovered. It is his intention to hold a reunion for ex members where the photographs will be displayed, prior to next year’s anniversary. As well as this project, Bob raises funds for Erskine Hospital by playing the bagpipes. At the moment, he is not asking the public for assistance, however potential sponsors would be welcomed. The Edinburgh Reporter wishes Bob well with his efforts on behalf of this worthy cause. A very deserving cause, these young men gave their lives so that we may live in peace and freedom, they have my full respect!